Once you have set up the four parts of your NetSuite email marketing campaign (saved search, dynamic group, template, campaign) http://www.variablevisions.com/articles/How-to-set-up-a-NetSuite-email-campaign we can now apply a promo code. Promo codes not only offer your customers an incentive to buy, they also allow easier tracking of purchases associate to an email campaign. Without a promo code, NetSuite can not associate a sales order to a campaign that went to existing customers, only to campaigns to leads…that convert into a customer from the campaign sale. Under Related Information in your new marketing campaign, create a new promotion. Set the start and end dates and apply your discount rate. Remember to name your Coupon Code the same as the visual information in the email blast…the Promotion name is only for internal use only. Make sure you Save, and then edit the campaign again so that the newly created promotion from Related Information can now be selected as an option under Events > Promotions. Now you can send your email campaign and await customer action. 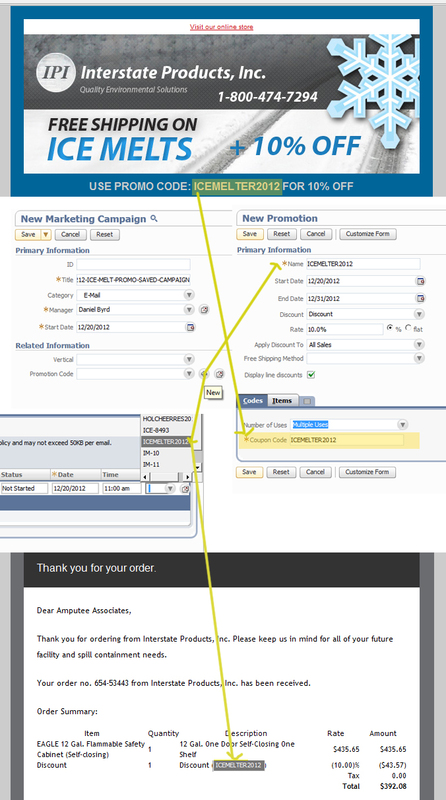 The promo code is displayed on the auto-generated order confirmation email address and on the sales order as well. To approve the sales order, you must click the apply promo to order button…it will apply the discount automatically but requires manual apply to approve order.